If you could please direct your attention to Megan Hess's Instagram page, I'd like to suggest the creation of a new kind of coffee. Hess has given us the first proper Monday morning wake-up and it has everything to do with a jolt of caffeine paired with a kick of Coco, Coco Chanel that is. Imagine if you could walk into your local coffee haunt and instead of ordering your "skinny, half-caff, soya, extra hot, wet latte," you could just say I'll have a Coco-chino. 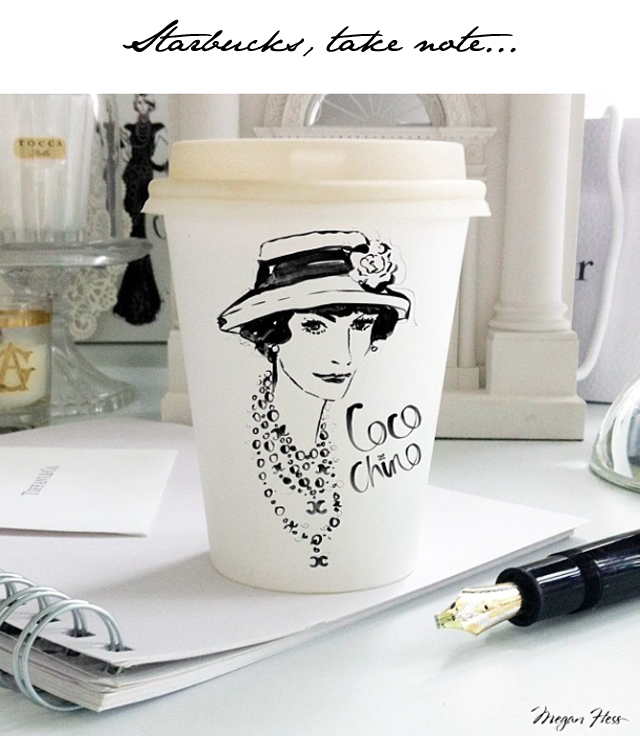 Of course said cappuccino would have to meet the regulations of the fashionista's standard coffee order, but when has Coco Chanel ever done wrong? We'd imagine a Coco-Chino to be made with skimmed milk, a double shot of espresso and topped with a just a dash of cinnamon and dark chocolate. Now, would Karl Lagerfeld line up for a cuppa? Karl, queue? We think not! Ps. Do follow illustrator Megan Hess on Instagram.... her fashion illustrations provide daily bouts of beauty.